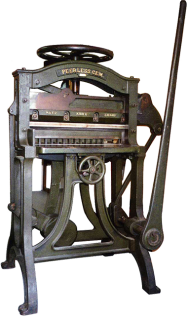 This beautiful piece of machinery is a 23-inch hand-operated Peerless Gem paper cutter. It was made by the Peerless Printing Press Co. of Palmyra, New York. Excluding the handle, it is 38″ wide by 48″ deep. The height to the top of the handle is about 60″, and the cutter weighs about 750 pounds.